In December of last month, in Canary Wharf station, in the heart of the financial district, international humanitarian charity, Penny Appeal unveiled 5 life-size ice statues symbolising homeless families to promote their winter campaign. The frozen family depict the plight of the 140* families who become homeless every day, and the 900* children who become homeless every month, right here in the UK. 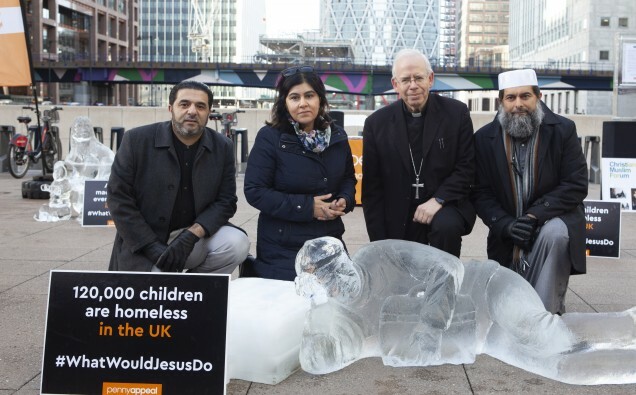 The Rt Revd Paul Hendricks and Baroness Warsi and Imam Shaykh Ibrahim Mogra unveiled the ice sculptures, following a brief speech highlighting the ways in which Britain’s diverse range of communities can show compassion and become more aware of homelessness during the festive period. Asking “What Would Jesus Do?” the campaign will align people from all backgrounds together in the spirit of giving during the festive winter period. Aamer Naeem, CEO of Penny Appeal says, ‘To some, it may seem strange that a Muslim charity is asking people what Jesus would do, that is, until they find out that Muslims also believe in Jesus. To Muslims, Jesus, like Muhammad, was a prophet, and showed compassion and warmth to those in need. Our campaign reaching out to help the vulnerable homeless in the UK runs all year round, but this is the season where we feel more for those in need due to the harshness of the weather’. Many homeless people remain hidden from view during winter, choosing to bus-surf or find other means of keeping warm. Both Muslims and Christians are inspired by their faiths to help them. Penny Appeal have placed the sculptures outside of the warm, cheerful interiors of some of London’s biggest offices to inspire people to give to an otherwise invisible community, just as Jesus would do. Volunteers from Penny Appeal’s Team Orange will be distributing emergency relief to the homeless throughout the season, as well as hosting afternoon tea for elderly people who might be cold or lonely during winter and delivering gifts to children in hospital to offer some cheer during the colder months.